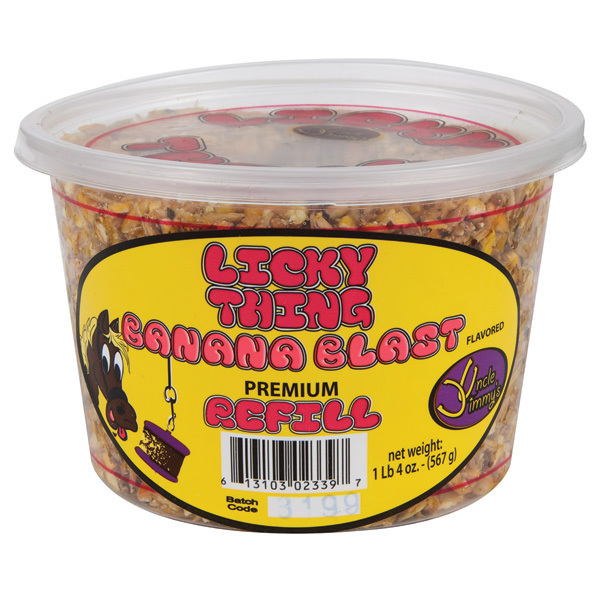 Uncle Jimmy's Licky Thing is a premium refill made to fit all major treat holders. Not only are they a smart and economical choice they are great tasting and packed with vitamins and minerals that are essential for the horse’s everyday needs. Ground Corn, Sugar, Corn Syrup, Oats, Soybean Meal, Soybean Hulls, Wheat Middlings, Vegetable Oil Refinery Lipid, Corn Germ Meal, Molasses Products, Calcium Carbonate, Calcium Phosphate, Salt, Brewers Dried Yeast, Sodium Bentonite, Vegetable Oil, Vitamin A Supplement, Vitamin D2 Supplement, d-alpha Tocopherol Acetate, Riboflavin Supplement, Thiamine Mononitrate, Natural Flavors, L-Lysine, Vitamin B12 Supplement, Calcium Pantothenate, Niacin Supplement, Menadione Sodium Bisulfite Complex (Source of Vitamin K Activity), Choline Chloride, Manganous Oxide, Ferrous Sulfate, Cobalt Carbonate, Copper Sulfate, Zinc Oxide, Potassium Iodide, and Sodium Selenite. There are currently no questions for Uncle Jimmy's Licky Thing Horse Treat - be the first to ask one!